A new plant-based visionary, Funky Fields, has launched on local soil to support a growing movement towards organic, vegan and ethically-made food with its first product, Organic Spreadable, available now. The vegan butter will lead the suite of plant-based food items from Funky Fields, set to reinvent the milk and meat category by challenging the perception that dairy and meat-like products can only come from animals. “Some foods are just not the same without butter. With that in mind, we have made an alternative for those looking to eat dairy-free, gluten-free, naturally, ethically and organically from the convenience of their local supermarket,” said Funky Fields Australian Director, Peter Jones. 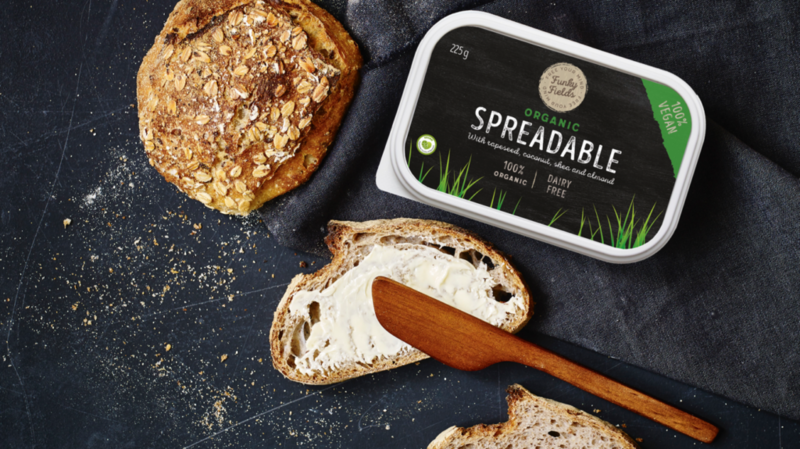 “For baking, cooking, buttering bread or even melting over hot corn, our Organic Spreadable uses internationally-recognised innovation to keep the same mouth-watering butter taste Australians love, but dairy-free – as it should be,” Jones continued. Made from select natural ingredients rather than milk and cream, the Organic Spreadable contains Almond, Coconut, Shea and Rapeseed and is perfect for those with dairy, health concerns, or simply looking to support the environmental in purchasing sustainably. The Organic Spreadable will be closely followed by Funky Field’s hero product, Minced, a meat free, 100% vegan meat substitute with the same structure of meat and even the same protein content (18%) when cooked. Funky Fields Organic Spreadable is available at Woolworths nationwide for $5.50 (225g). Delicious either straight on bread or within recipes… an Mkt. office favourite!